I have put all my code in a class called PopupCalendar and the first thing I do is to create a new PopupCalendar and then call the applyPopupCalendar(). When a new object is generated I make sure that self is the same as this. So that I can refer to self later on to access the objects functions. I feel this is a bit confusing, but this is the first solution I could find that worked. The applyPopupCalendar() loops through all elements with the class datepicker and adds a click event listener that calls the showPopupCalendar(). The showPopupCalendar() begins by figuring out what dates to show and then it renders or removes the calendar pop up depending on it's current state. After the pop up has been rendered there are to types of click events added. The first is on each day in the calendar, addEventToDays() that calls updateForm(). updateForm() updates the input element with the selected date and changes the select state on the days in the calendar box. One option her is to just hide the box when done. 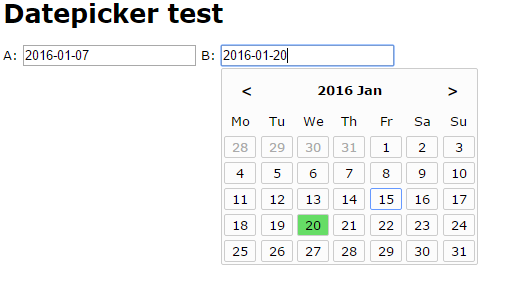 The second click event is for the calendar navigation, addEventChangeMonth(). This enables us to switch to a previous or an upcoming month, then it re-renders the calendar pop up by calling showPopupCalendar() twice, first to hide it then to show it again. This could easily be improved upon. But it was too easy just to let it be like this for now. // Get selected Date, only the date part if a time stamp is included. elem.style.display = 'none'; // Do not show the date picker at this time. // This function does not start with _, that indicates that it can be used from outside.